I love this rug. Quality is good. It is unique without being weird. A stunning Oriental pattern highlights this hand-tufted wool rug. 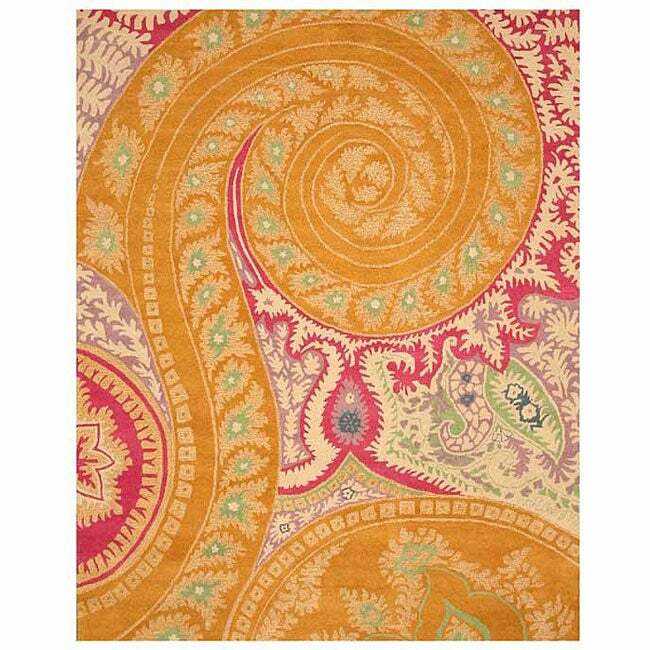 This area rug features shades of pumpkin orange, fuchsia, lavender, ivory, green and teal. I had great hopes for this area rug, but the color is truly a mustard yellow, not orange as described. Even the photo on the website showed as a livelier, more vivid orange tone than the rug that arrived at my house. This rug was supposed to sit on a hardwood floor of red oak with lots of dark honey tones, and the gold of the rug just blended right in, instead of contrasting as a true orange. Sadly, this rug was returned. But if you searching for a nice deep golden area rug with shots of fushia and aqua, this is your item. The colors listed in the picture are no where near as vibrant as the actual rug. They are more muted. Same shades just not as bright. The overall quality is wonderful though. Very good rug, just wish the colors would have more matched the picture. Sadly, the colors are highly misrepresented in the web photos of this rug. It is actually very muted shades of pale mustard and dull raspberry. The entire impression is faded and not at all the bright and colorful rug I expected. I will be returning it. I absolutely love the new rug. It has beautiful, vibrant colors that will go great with my bohemian themed room. Is exactly as described. The only negative I can say is that it smelled really bad upon arrival. The packaging was very thorough, but when opened the item smelled a bit like old shrimp hulls. After a good febreeze/vacuum treatment and a little outdoor breeze it's fine now. Might have just been mine though. I like the rug. It matches exactly what the description states. Sweet, sweet rug. Lots of fun colors. We paired it with the IKEA Friheten sofa in the raspberry pink and it is just perfect and girly. Perfect style for my house and will go well with the aqua colored mid-century modern bench that I also ordered.